Fun Dog Birthday Ideas: Ice Cream & Birthday Cake For Dogs! Want to do something special for your dog’s birthday this year? For both of our dogs’ birthdays, we always take them to the local Dairy Queen. When you tell them at the drive-thru that you want a doggy treat, they give you a small cup of ice cream with a dog treat on top. We order our ice cream, pay for it, and get our doggy ice creams at the same time. We don’t make a habit of taking them to Dairy Queen, but for special occasions it’s worth the trip! Have you ever made a birthday cake for dogs? It’s fairly easy, you just need to use dog-safe ingredients. Here are some good dog cake tips. If you don’t have time to make a birthday cake for your dog, you could always buy a dog birthday cake online. 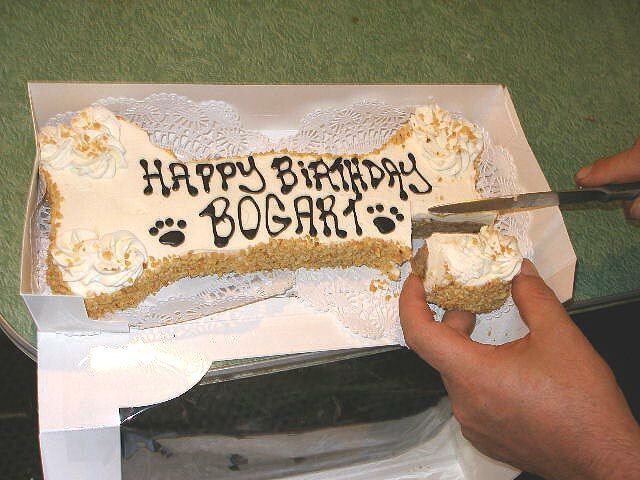 For example, you could order a vanilla or carob cake for your dog. Instead of a dog birthday cake, you could always get your dog a platter of treats for his birthday. Or, make your own using these homemade dog treat recipes. There are lots of fun food treats you can buy or make that dogs are able to eat! Okay, who here has gone all out and hosted a birthday party for dogs before? Gift Ideas For The Dog Who Has Everything!